Receive a Free Laser Treatment in Shrewsbury, Freehold, Wall, or Lacey ($75 – $125 Value). Contact Our Office Today 732-345-1377 and Request Your Free Treatment! K-Laser Therapy is available at each of our facilities. As pain management evolves, we as a pain management facility seek the most up to date technology to help our patients. Pain management and the use of new technologies like the K Laser Therapy should be the first step in treating pain, then surgery and medications should be used as a last resort. At Monmouth Pain & Rehabilitation we strive to provide a comfortable, home like environment for our patients where their recovery is our number one priority. Providing the best in technological equipment is one way we strive to ensure that our patients are recovering and receiving the best treatment for their conditions. With that in mind, we are happy to announce the arrival of the K- Laser Therapy to our facility in Shrewsbury, Freehold, Wall, and Lacey NJ. The K Laser Therapy is the way in pain management, tissue repair and faster recovery times. Laser Therapy uses wavelengths of light to create therapeutic effects. These effects include improved healing time, pain reduction, increased circulation and decreased swelling. Laser Therapy can help heal, reduce inflammation, increase nerve inflammation, nerve function and blood flow. Laster Therapy treatments are painless and they increase circulation, drawing water, oxygen and nutrients to the damaged area. This process creates an optimal healing environment that reduces inflammation, swelling, muscle spasms, stiffness and pain. As the injured areas return to normal, function is restored and pain is relieved. One of our goals as a pain management facility is to treat our patients without the need of surgery or medications. We want to take the most natural approach as possible to the healing process. Laser Therapy gives us that advantage because it promotes healing and pain relief without surgery and pain-killing medications. For management of chronic pain, Laser Therapy can produce dramatic results, is non-addictive, and essentially free of side effects. A typical treatment is 3 to 9 minutes long, depending on the area size being treated. Acute conditions may be treated daily, especially if they are accompanied by significant pain. More chronic problems respond better when treatments are received 2 to 3 times a week. Patients may feel improvement after the very first treatment. Sometimes patients will not feel improvement for a number of treatments – which does not mean that nothing is happening. Each treatment is cumulative and results are often felt after 2 or 4 sessions. 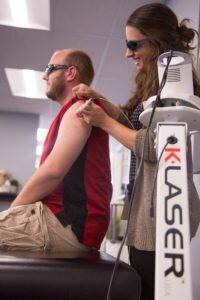 Does treatment with the K-Laser hurt? There is little or no sensation during laser therapy treatment. Occasionally one feels mild, soothing warmth or tingling. Areas of pain or inflammation may be sensitive briefly before pain reduction. The K-Laser is often used with other forms of treatment. One of our most important features here at Monmouth Pain and Rehabilitation is that we offer Chiropractic Care, Physical Therapy, Acupuncture and Pain Management in one location. By providing all of these services at our office, we are able to ensure that our patients receive the best possible treatment. Many patients often prefer a progressive, non-invasive therapy to a drug regimen for the treatment of chronic pain. K- Laser therapy provides that solution without side effects. K-Laser treatment works especially well when it’s used in conjunction with other forms of therapy. Additional therapy increases the effectiveness of K-Laser treatments. To learn more about our facility, the K-Laser, or to make an appointment, contact our offices today.